With the coming of the digital age over a period of the last three decades, the letter “e” is used to refer to the electronic world. Formerly known as computer-based training, e-learning has also come of age and is increasingly oriented to real-time learning, that is, activities facilitating simultaneous interaction between learners and instructors. Further, the knowledge explosion makes it more a necessity than a luxury even for emerging economies to consider the e-learning platforms and adopt e-learning strategies. 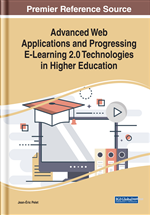 The objectives of this chapter are to understand the essentials of effective e-learning strategies and identify the barriers and facilitators in embedding e-learning for emerging economies so as to align well in this knowledge era. The methodology adopted is in depth literature review and grounded theory approach. Contextual analysis and is restricted to effectiveness of e-learning from an emerging economy point of view. E-learning is certainly becoming the most accepted tool in organizations both as a training pedagogy and knowledge management. Corporations are discovering that ELearning has many of the same attributes as basic Knowledge Management processes, and thus can be a tool for Knowledge Management (Wild, Griggs, & Downing, 2002). Knowledge Management major aim is to establish a positive learning environment in which people can conduct all sorts of learning activities and share knowledge with other people in organization (Bukowitz & Williams, 1992; Hong & Kuo, 1999; Martensson, 2000). Liu and Wang (2009) argued that ELearning is the technology and tool supporting Knowledge Management and Knowledge Management is the premise and operational platform for it. Transfer and communication of tacit knowledge is considered crucial for effective learning yet it is the trickiest part. Tacit knowledge can be communicated through interaction, collaboration and conversations in communities/network of practices (Roknuzzaman, Kanai, & Umemoto, 2009). Ponce (2003) argued that data mining methods can be used in ELearning systems. Strategies: A method or plan chosen to bring about a desired future, such as achievement of a goal or solution to a problem. Strategy is a result of choices made, on where to play and how to win, in business it has got to do maximize long-term value. Learning Management Systems: Learning management is the capacity to design pedagogic strategies that achieve learning outcomes in students, where the emphasis is placed on student learning rather than instructor preparation. A learning management system (LMS) is a software application or web-based technology used to plan, implement, and assess a specific learning process. Training: Organized activity aimed at imparting information and/or instructions to improve the recipient's performance or to help him or her attain a required level of knowledge or skill. E-Learning: Electronic learning (or e-learning or eLearning) is a type of education where the medium of instruction is computer technology. In some instances, no in-person interaction takes place. It can be defined as a planned teaching/learning experience that uses a wide spectrum of technologies, mainly internet or computer-based, to reach learners. Knowledge: Acquaintance with facts, truths, or principles, as from study or investigation; general erudition, familiarity or conversance, as with a particular subject or branch of learning including acquaintance or familiarity gained by sight, experience, research or report.